Delta Air Lines and Aviation Performance Solutions prepare 16 flight simulator instructors to design fleet‑specific UPRT. Delta Air Lines has partnered with a U.S.-based flight training organization specializing in airplane upset prevention and recovery training (UPRT) to develop advanced-handling training programs for eight jet airplane types.1 A cadre of 16 simulator instructors being trained in the first half of 2015 is part of a larger group of simulator instructors who comprise roughly half of about 450 total Delta instructors. “Delta embraces the critical importance of providing our pilots with advanced training to maintain air travel as the safest mode of transportation,” Jon Tovani, a Delta captain and its managing director, flight training, said in April during the World Aviation Training Conference and Tradeshow (WATS 2015) in Orlando, Florida, U.S. The airline is partnering with Aviation Performance Solutions (APS) to develop the training programs. The advanced-handling training essentially will provide the more than 11,000 Delta pilots with increased skills and knowledge designed to prevent upset conditions from developing and help ensure flight crews’ correct recovery responses to upsets, according to Tovani and APS President Paul BJ Ransbury. Among the unexpected cases documented in worldwide airlines’ routine flight data monitoring (also called flight operational quality assurance [FOQA] programs) have been “flight control malfunctions that elicit upsets that require the pilot to take action to recover,” “weather phenomena that create circumstances where the pilots have to take action to recover,” and “pilot error [involving] manipulation of the controls in a way that leads to an undesired aircraft state,” Tovani said. In-flight examples of pilot interventions from Delta’s FOQA database include two cases of A330s encountering mountain-wave downdrafts. One occurred at Flight Level 330 (about 33,000 ft), causing the envelope-protected flight control system to increase pitch to maintain the altitude, and then to increase thrust to attempt to maintain selected airspeed. In each case, the pilots had to descend 4,000 to 5,000 ft.
Other partnership elements are preparatory academic training using web-based and tablet computer–based2 delivery, on-aircraft UPRT and “dedicated training by APS in Level D, CAE transport category simulators to learn how to apply concepts from the Airplane Upset Recovery Training Aid, Revision 2 to their airline training program,” he said, noting that this knowledge and related hands-on practical skills are necessary to safely respond to possible-but-rare situations encountered in flight. “It is the responsibility of commercial aviation operators worldwide to implement and maintain the recently mandated, industry-standardized loss of control–in flight solutions.” He also cited the International Civil Aviation Organization’s (ICAO’s) Doc 10011, Manual on Aeroplane Upset Prevention and Recovery — published in 2014 — and the new FAA Advisory Circular 120-111, “Upset Prevention and Recovery Training,” issued April 14. Content design enables Delta Air Lines to add fleet-specific information to industry-vetted modules for Internet-based course delivery. The five-day, integrated UPRT course comprises academic work (requiring study during the week before the course), on-aircraft experience and in-simulator sessions. As of late April, six simulator instructors had completed the course, and the courses for the other 10 were set for completion by mid-year. Some of the most talented simulator instructors at the time — lacking any military all-attitude flight experience or upset recovery training — instinctively reverted to incorrect control inputs that “would probably not be a recoverable maneuver in an airliner,” Tovani said. In addition to expected third-party auditing, Delta’s AQP and training record divisions will track accomplishment of UPRT training objectives with AQP oversight by the FAA. Tovani also said that the airline will be open to sharing with other airlines the lessons learned from the partnership. 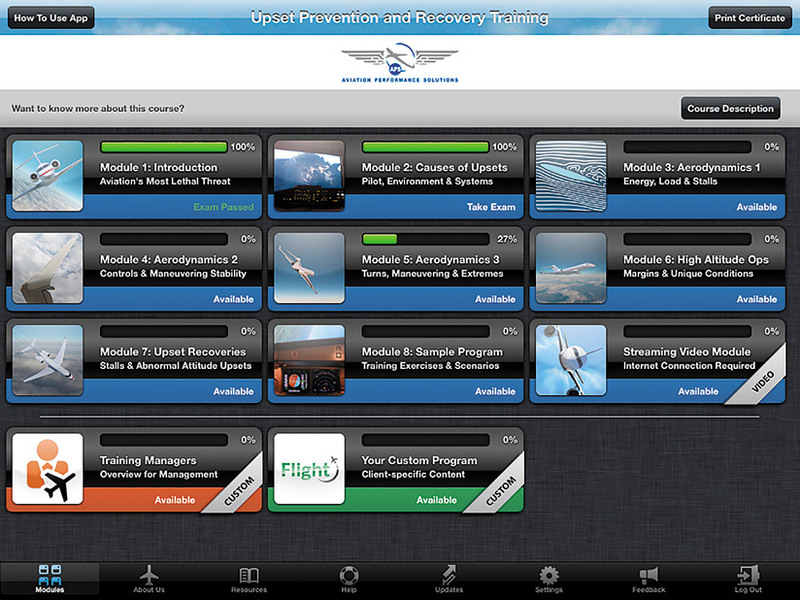 In the big picture, UPRT is only one of several priority subjects within Delta flight training. Relatively speaking, it involves knowledge and skills rarely applied in actual line operations. As an example of subjects with everyday application, he cited Delta’s parallel efforts to strike a training balance between automation skills and manual flight skills. 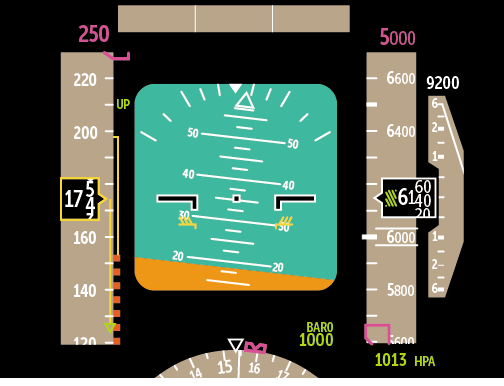 A training module shows a primary flight display during a nose-high airplane upset scenario. Prospective client airlines ask him what value the staff will add. “We say, ‘We are going to teach you what the industry wants you to know and what the industry wants you to do. We have some special tools to help you be better at that than if you didn’t use us,” he said. The emphasis also is on benefiting airline simulator instructors at all levels of experience, from zero experience flying beyond 60 degrees of bank to all-attitude background of a military test pilot or fighter pilot, or aerobatic experience. To date, hardly any airlines have declined the on-aircraft elements of the course for their instructors, he said, adding that the on-aircraft graduates universally see the value. “There are certain specific things — like the psycho-physiological aspects of UPRT, the motion cueing, the stress, the reality factor, startle factor, the things that they can experience in a real upset — that really make them better able to teach UPRT in a simulator,” he said. Many of the benefits involve their ability to relay first-hand experiences and cautions about real-world differences, he said. 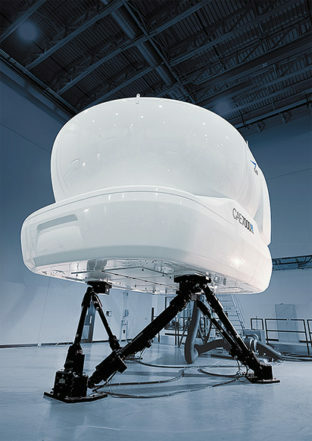 Auditing processes will assess how tightly the evolving Delta enhancements comply with industry principles and vetted information; whether there are any areas of potential negative training; and whether any of the competency-based, scenario-based training that Delta’s simulator instructors develop proves to be inappropriate or unrealistic for effective UPRT. “This is also the best way to really judge the upset prevention capability of the pilots in more of a real-world situation as opposed to purely maneuver-based upset recovery,” Ransbury said. Currently involved Delta aircraft types include Airbus A320 and A330; Boeing 717, 737, 757/767 (flown as a single pilot category at Delta) and 777; and McDonnell Douglas MD-88 and MD-90. 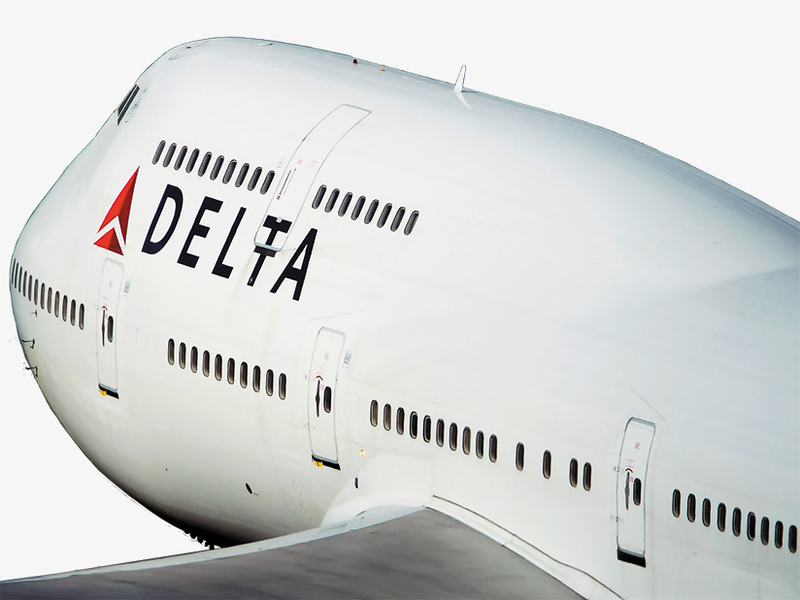 The app version for the Apple iPad was selected by Delta for academic training of the initial cadre of Delta flight simulator training instructors.